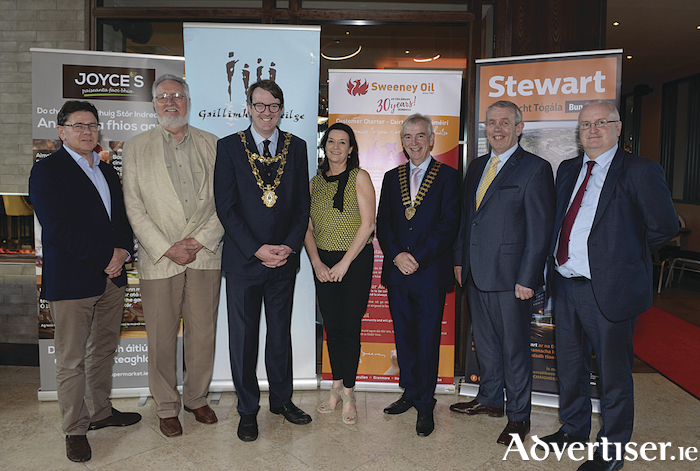 John Sweeney, Sweeney Oil, (Sponsor of the Fulacht Fia), Seán Stewart, Stewart Construction, (Sponsor of the Fulacht Fia), Mayor of the City of Galway, Cllr. Níall McNelis, Bernadette Mullarkey, Cathaoirleach Ghaillimh le Gaeilge, David Hickey, president of Galway Chamber, Pat Joyce, Joyce’s Supermarkets Galway, (sponsor of the Fulacht Fia) and an Dr Aodhán Mac Cormaic, Stiúrthóir na Gaeilge, An Roinn Cultúir, Oidhreachta agus Gaeltachta at Fulacht Fia Chairde Ghaillimh le Gaeilge which took place in the Galmont Hotel. The sun made a welcome return to Fulacht Fia Chairde Ghaillimh le Gaeilge as Cairde and Stiúrthóirí enjoyed a wonderful evening of music and food wn The Galmont, Bóthar Loch an tSáile, Gaillimh. The Fulacht Fia was kindly sponsored by Cairde Ghaillimh le Gaeilge: Joyce’s Supermarkets, Stewart Construction and Sweeney Oil. Míle buíochas dóibh ar fad. At the event, Bernadette Mullarkey, Cathaoirleach Ghaillimh le Gaeilge extended a warm ‘céad míle fáilte’ to the newly elected Mayor of the City of Galway, Cllr. Níall McNelis. She also thanked all of the funding organisations who have supported Gaillimh le Gaeilge over the years. Gaillimh le Gaeilge’s main support comes from the Department of Culture, Heritage and the Gaeltacht, through the National Lottery. They also are supported by Galway City Council and Cairde Ghaillimh le Gaeilge through the Galway Chamber. This support is essential for the organisation to maintain their various bilingual services and practical supports for those who wish to use the Irish language in their daily businesses and organisations in Galway city. Cathaoirleach Ghaillimh le Gaeilge also thanked the media for their support chun ‘scéal’ Ghaillimh le Gaeilge a choinneáil i lár an aonaigh and praised the businesses who bring the Irish language to life in the city. The Gypsy Jazz Trio entertained the crowd and created a wonderful atmosphere as they enjoyed the tasty food in the Galmont. Among Cairde Ghaillimh le Gaeilge in attendance were; David Hickey, President of Galway Chamber, Alan Esslemont, Ardstiúrthóir TG4, an Dr Aodhán Mac Cormaic, Stiúrthóir na Gaeilge, Emma Dillon-Leetch from the Connacht Hotel, Gradam 2018 winner, Éamon Ó Cuív TD, Galway City Councillors; Cllr Dónal Lyons, Cllr. Pádraig Conneely, Cllr Terry O’Flaherty as well as Declan Varley, Group Editor of the Galway Advertiser and Bernadette Prendergast, Galway Bay FM. Gaillimh le Gaeilge would like to thank everyone that attended and would like to say a special ‘míle buíochas’ to the sponsors of the Fulacht Fia. Buíochas to all of the staff at the Galmont, who provided fabulous food and especially to Colm who provided an excellent ‘Seirbhís trí Ghaeilge’! They also kindly sponsored ‘Deoch an tSamhraidh’ for all of the Cairde. The Fulacht Fia officially concludes Gaillimh le Gaeilge’s social/networking events until September and provides the organisation with an opportunity to say a ‘míle buíochas’ to all their ‘Cairde’ and to all those who have supported the organisation over the past year. Don’t forget that Gaillimh le Gaeilge is available to assist you to incorporate the Irish language into your business FREE OF CHARGE. For more information contact [email protected] or 091 568876.